Since the summer of 1951, my family has spent more time at Birch Rock than just about anywhere else. Of course, this is no accident, since when my grandfather Peter Foss first arrived at camp he was hooked. So hooked in fact that he decided to send his son Ted to Lake McWain in 1980 and his grandsons when the time came in 2013. Birch Rock is the kind of place that was as important to my grandfather’s childhood as it has been to my brother’s and mine two generations later. My grandfather’s Birch Rock experience, so relevant to why I return year after year, echoes the values I’ve seen around me at camp every summer. At 77, he recalls the smiling faces of the staff and counselors, and the lessons they worked so hard to teach him. Of the general atmosphere, he recollects, “so much activity, comings and goings, and learning to appreciate the outdoors and fellow campers.” Similarly, the exceptional kindness of the adults has not been forgotten. Gramp shares, “I also remember Albert, the chef, who would greet me at every meal.” These memories ring true for how Birch Rock strives to be in the present, as they continue to give boys an unfailing foundation of empathy and gentlemanliness. Were it not for his many fond memories of all Birch Rock did for him, my grandfather might never have considered it the perfect place for me to spend my summers, and I would never have been embraced by the warm community that has taught me so much. When I was first introduced to the idea of Birch Rock, all I knew about it was that it was a camp in Maine with water activities and that my grandfather had gone there. As a 10-year-old kid though, that was about as cool as it got. I still remember the moments when I first arrived at camp: taking a right at the Birch Rock sign with its red flowers, seeing kids playing basketball on the court, craning my neck out as we pulled down the steep driveway. I soon found out just how welcoming Birch Rock was, and still is, to everyone joining the tight-knit community. Even at the time, my perceived family connection to the camp already made me feel more at home in my first weeks, and gave me pride for the visible history in the plaques on the walls of the Lodge. Being comfortable at Birch Rock opened up my summers, allowing me to stretch myself and try new activities. Every time I swim in the lake, I remember both the unfortunate Relay Friday of my first year that left me hyperventilating on the catwalks, and the incomparable feeling of walking through the tunnel of outstretched arms after finishing my Whale. 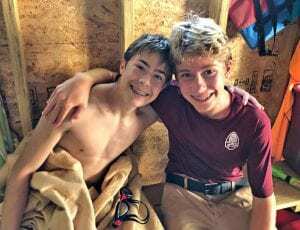 When my brother Noah followed in my footsteps, he enjoyed camp as much as I did (though in different ways), and still identifies strongly with our family legacy. Noah and I have each attended Birch Rock for five summers, and hope to still be there when our younger cousins, Miles and Wyeth, come in a few years. Sharing Birch Rock with our grandfather and each other has been incredibly important to us, and we both feel very blessed to have camp in our lives. 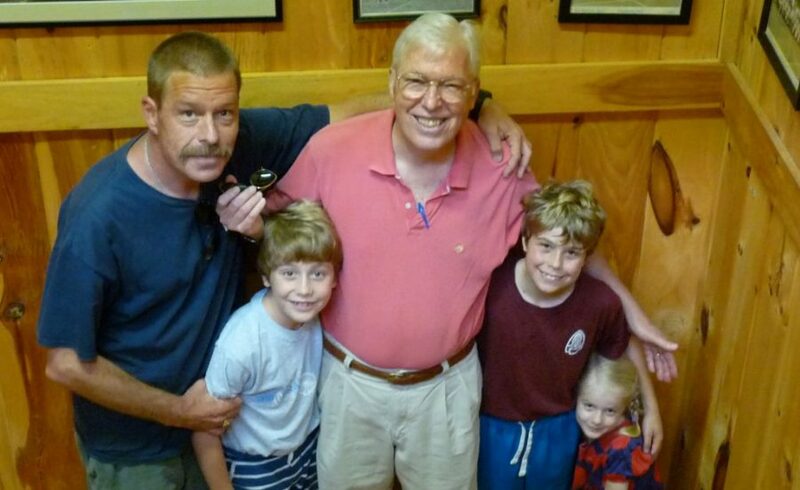 Though both Noah and I have had treasured experiences at camp — training for Junior Maine Guide and winning the Frisbee Masters — some of our best moments have been shared with Gramp. Each year, he faithfully accompanies us to camp, snapping mandatory photos by our cabins and walking around the up and down hilly campus. Standing by Gramp at the Birch Rock and pointing out his plaques to him mean a lot to both him and us, and cement the pride we all feel about camp. Next year, I plan on walking with him around our many paths, and showing him my Whale plaque from the summer of 2018, on which I specifically asked to have my middle name and his last name, Foss, included. As much as it was a personal accomplishment, the big swim was something I could only do because of the deep-seated love my grandfather, my great uncle, and my uncle all found at Birch Rock, and passed on to Noah and me. In that sense, we are always adding to the Foss legacy at Birch Rock, a place we’ve been fortunate enough to call our summer home. May I be lucky enough to walk the time-honored Birch Rock paths with my grandsons someday. Next PostAugust 3 - Hungarian Hijinks!